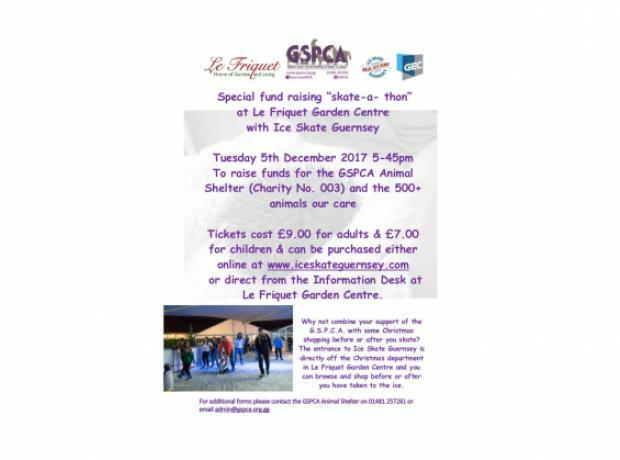 The Guernsey Society for the Protection of Cruelty to Animals (G.S.P.C.A) is the chosen charity of Le Friquet Garden Centre for 2017 and has teamed up with Ice Skate Guernsey to create a special fund raising “skate-a-thon” on Tuesday 5th December 2017. All Ice Skate Guernsey tickets purchased for the 5pm-5.45pm session on Tuesday 5 th December 2017 will be donated to the G.S.P.C.A. Tickets cost £9.00 for adults and £7.00 for children and can be purchased either online at www.iceskateguernsey.com or direct from the Information Desk at Le Friquet Garden Centre.